Ah, the weekends. The 9-5 grind is exactly that, a grind, and by the end of the day, I’m generally exhausted. But the weekend provides me with roughly 55 hours of usable free time – 5pm Friday to midnight Sunday – and I try to make it a point to use as much of that time as possible. Last weekend was no exception. My mom had asked me if I’d like to bring the guy that I’m seeing to family dinner on Friday night – my favorite meal of the year, corned beef and cabbage – and I’d immediately declined the invitation. But then I thought about it, after telling him that I’d declined his invitation without even asking him. I realized that it probably wouldn’t be too bad if he met my people, so I re-invited him, nervously. I’m known for bringing guys home to meet the family very early on – maybe it’s the sadist in me that likes to see them sweat, or maybe it’s that I want to see how they can manage themselves. My family is quite lovely, so it’s not like it’s difficult, but I’m a firm believer that you can tell a lot about a man by the way he interacts with your family in that sort of environment. Is he polite? Does he speak up? Is he patient? I’m impatient, usually polite, and always talking, so I need someone who can be patient, polite, and match my level of enthusiasm for the conversation. I love my family, and I want them to know the people I spend my time with, and for those people to know my family. Also, free food. Plus, my grandmothers are pretty fantastic people. And so that happened. I picked him up, ten minutes late (surprise, surprise), and we made our way the four blocks to my grandmother’s house (convenient). The evening was wonderful. He talked – he may have talked more than I did! (Ehhh, probably not.) He deftly handled the faux-argument we have over the men’s side of the table (they always mess up the passing order to make sure that their buddies get the best food first – and the women always tease them about it), falling in line with the “rules” of the passing and the back-passing. He definitely got in on the good end of the back-passing – he had meat, potatoes, and cabbage before I’d even gotten the bread. We lingered for four hours. He got to see the reenactment of the guys and my mom dropping me off at college – my uncle’s impression of me sobbing and begging them to take me back to Denver includes, “I’ll go to DU, I swear!” and is fantastically hilarious – as well as my mom’s excellent impression of the “purse carrier,” which is exactly what I’m not allowed to marry. It was a really wonderful dinner, and I felt so happy to be surrounded by such lovely people, and to come from such a loving and kind family. On Saturday, I went to see an old co-worker, who’s now my mentor/friend. She has the most adorable two-year old son, so I was happy to play with him while we caught up. It’s so easy to lose touch with people once you don’t see them every day, so I’ve been trying to make an effort to stay in contact and not lose people just because they’ve slid out of the periphery. Also, she’s very good about getting in touch with me, so that definitely helps. I always laugh and thank her for being a part of my village (village people, I think that’s what I’m going to call my wonderful network of humans), because I’ve been to her kid’s birthday parties, her family events, and I was the first person to ever babysit for her son. Babies are the sweetest things. He’s talking up a storm now, and he has the biggest eyes and the happiest smile. I chased him and tickled him, and his peals of laughter brought me so much joy. I love how determined they get, or how frustrated, or how giggly. There is so much pure energy and pure emotion, and as I left, he stood by the door and waved to me, over-ready for his nap. My friend texted me after I left and told me that he was out 60 seconds after she put him down. For some reason, I was in cleaning mode on Saturday. I have been struggling to get my house under control for a while now (again, no surprise here), and I wanted to go home and do some good work. And so I did. I got my room rearranged, opened up the box that contained my new mattress and got it unfurled, foam puffing up immediately. I got more things folded and hung up and stuffed into drawers (I mean, folded, definitely neatly). I threw away trash and cleaned out the fridge. I scrubbed the sink and unloaded and reloaded the dishwasher. It was nice progress, and it felt good. My friend Gina will help me with the rest of it tonight. Saturday night, we went to my old favorite Thai place. I’ve only ever ordered one thing there (five years is a long time to not stray on a menu, and I intend to keep up the streak) – pineapple curry, medium. Sometimes with shrimp, sometimes just extra pineapple, sometimes veggies. Always delicious. That is the food I crave on Sundays (when they’re closed), when I’m sad, or sick, or happy, or ….any time. After that, we stopped into the PS Lounge – if you haven’t done that, you need to. Your life will get so much better. We had a few drinks there, and sat talking, oblivious to the bar around us. (Not entirely, but it makes it sound so much more romantic if I put it that way, doesn’t it?) Regardless, the conversations are so fantastic. I really like that I’ve met someone who knows stuff about stuff I don’t know. And who’s willing to tolerate the things that I love. He told me the other night that he loves that I always have something to add – actually add, a different perspective or input – to conversations. I laughed, what else am I going to do? We haven’t really disagreed about anything yet, and I keep trying to find something where we have drastically differing viewpoints…thus far, no luck. My friend Jacob was playing at a bar down the road, so tipsy adventure me decided that we needed to at least pop in. So we did, briefly. I danced a little less than I would have liked, nervous energy coursing through my body. Bringing someone into your comfort zone is so hard. I like people. But it’s funny, because as much as I am uneasy in new places or doing new things, I’m equally uncomfortable when I’m bringing someone into my spaces, my people, my things. Sunday morning, we woke up and went for a bike ride. He was so sweet a few weeks ago and put my bike back together for me (to be fair, he’s the one who took it apart in the first place….but I had a tangled chain somehow? ), so I’ve been able to ride around with him. I’m terrified of city biking – too many people in Chicago get smashed by buses on bikes – but I’m getting better! We did 20 miles on Sunday, looping through the park on our way downtown, made a pit stop for ice cream, and then to REI (obviously), and then back around to the water treatment plant, and then back. By the end, I’d lost all of my energy, and the last few miles were me playing the mental fortitude game in my head. But I made it! There’s an uphill part right at the end, which is miserable. It’s the last big push before relaxation, and when I made it, I was overjoyed and that feeling of accomplishment (or at least, not failure) washed over me. And on the way I ran into a couple of friends who I hadn’t seen in over a year, which was wonderful! Ha, to make things way sexier, I wore bike shorts. And since I left my car at the Thai restaurant the night before, I had no shoes to wear other than my cheap little black flats. So between the bright orange bike shirt and short combo and the completely not bike shoes, I made a very official-looking exerciser. You know, I make fun of the bike shorts/shirt people (and will continue to do so…), but, there’s something to it. My sit bones were not even sore as a result of the padding in the shorts. Then I went to Verizon and got a new phone. I’ve had my mom’s old iPhone for over a year now, and she had it for two years before that, and the thing was just starting to lose everything. No battery life, no storage, the whole deal. It was time. Verizon can definitely thank Lil’ Wayne for pushing me over the edge; I’d been vacillating between the iPhone 6s (or trying to wait until the 7 came out?) and an Android, and Samsung came out with the Galaxy S7, which is water-resistant (seriously, you could put it in a fish tank and it would still work – I’m so curious but not $700 worth of curious, so I’ll leave that to the professionals and try to keep my phone on dry land), and that’s what did it. I’m a bath-taker and also incredibly accident-prone, so this seems like the right choice. Also, I had an S4 once, and I loved it. Apparently, the S6 was a miserable piece of equipment, and they’ve corrected that (righted their wrongs and put things back) in the newest version, so I’m in. We shall see. It’s been a funny adjustment, because I had forgotten everything. But alas, it’s like riding a bike. Your fingers and brain relearn the moves, and it’s been not even 48 hours and I’m back in the groove. Then I had dinner with my mom. First dinner, to be more accurate. We ate salad and caught up for an hour or so. It was so nice. I really love my mom. Then I had second dinner with my friend Emily. Man, I really love sushi and sake. I also love having friends that you’ve known forever. It’s so wonderful to love someone who really knows you. Emily has known me since high school, and I am really happy that we haven’t let our friendship slip. She’s beautiful, smart, funny, and all of the things I love. We had a nice time, except for the fact that my dark circles threatened to swallow me whole. I had that blank, empty stare of exhaustion by the time we were done. Finally, finally, came the sleep. My exhausted body was so pleased to find bed and pillows and blankets, and I was gone, weekend concluded. Not too bad for 55 hours, right? Errands, accomplishments, exercise, family, friends, dancing, date night, alcohol, ice cream, adventure, new technology, and babies! All of the best things. Nailed it. I remember what I was wearing when I walked into the Black Crown Lounge on Friday, July 13, 2012 – a sleeveless printed mini dress, black and tan. That’s not important. After a few near misses — the awareness of proximity not lost on either of us, even though he’ll never admit it — he approached me and asked me if I’d like to hang out some time. I giggled, and said yes. “Should I get your number, then?” he asked. Oh god, I’m the worst at being nervous. I gave him my number. The next night, I picked him up and we went to the goth bar. Totally my scene, but not his at all. We went home and he made me a martini (I’d never had one), and we watched a documentary. The rest is history. Five weeks later, we drove to the Grand Canyon. We got bored there. I demanded a lake, so we drove to Lake Powell and camped on the beach. It was just us and the sand and the lake. And the family of Mormons who couldn’t be bothered to pack out their trash, but that’s not important. They left before sunset, and we had the place to ourselves again. I fell in love with him that weekend and promptly dumped him after we got back to Denver. We never really stopped talking, though. Our relationship continued on, in some form or another. There were the bumps that came in the middle. There were several ultimatums that changed us, shaping our communication, and once, halting it altogether. When we began talking again last summer, he asked me to meet his parents. He took me to a barbecue. He made me dinners. We ran errands together. One night, he made dinner. I got to his house, and he asked, “You like salmon, right?” I don’t eat cooked fish. I lied, I think. He saw right through it. I still ate it. This time fell together slowly. There wasn’t any overt statement of expectations, although it was very clear that this was becoming a thing. I was going through a lot when all of this started, and he would hold me and let me cry into him. His quiet strength has always made me feel safe and protected in a way I can’t fully describe. I remember the first time we held hands in the car. It was an errand somewhere last summer, and he grabbed my hand. I thought my heart was going to explode. I didn’t say anything. It was a declaration he’d never made out loud. I’ll never forget how I felt that day. We celebrated our two-year anniversary last night. Two years since the night I met him. Two years of us, in some form or another. But mostly, it’s been about a year since we started this, the real thing. He’s not the romantic type, and we’re broke, so I wasn’t expecting much. But part of me hoped for something. When he came back, he directed me to grab my wine and get in the car. I didn’t even have time to get shoes. He grabbed bowls, the curry, the rice, and the wine. He started driving. He pulled up at a quiet little park a few blocks from our house. I got out and started towards the back of the park. He’d set up a picnic blanket and put down a ton of electric tealight candles around the blanket. It was really magical. “I expect to see happy tears!” he directed. I laughed, through happy tears. He told me he tried to get all teal-colored lights but that wasn’t possible, and that the sauce errand had taken forever since he’d been pulling the tabs out of the tealights. We ate curry, drank wine, and let the darkness settle around us. Then we laid on the blanket, surrounded by little tealights, and watched the bats fly above us. I was overwhelmed. I am thrilled that he did something so perfect. He put his hands on my face, told me how much he loves me, and kissed me, through more happy tears. I never saw this coming but I wouldn’t have it any other way. I love our little family. Our baby isn’t a baby any more! On July 4, Acorn turned one. Why is his birthday July 4th? Since we’ll never know his actual birthday, but we know it’s some time in July, we decided to make him an “America dog” (not my choice) and to give him a birthday we’ll easily remember. Last year, July 4th was the first day that boyfriend and I started hanging out again, too. We went to a barbecue in Boulder with some of his friends. So it all wraps up nicely. How did he become Acorn? Well – naming things just has to come. You can’t force it. So of course we panicked. Something so adorable also has to be aptly named. We thought. We thought some more. We suggested things — most of them Mississippi related. I threw out “Acorn” — pronounced “A-kern” — since I had found it hilarious that boyfriend’s grandpa had explained to me how much deer love “a-kerns” when we went hunting. I spent two days trying to figure out what an “a-kern” was before realizing they were acorns. We laugh because when we went to get him that bright orange collar before we left Mississippi, I was filling out the tag so it could be engraved while we were telling the store proprietor that we hadn’t named him yet. The tag clearly says, Acorn. At one point, boyfriend’s grandpa said, “Don’t know why the hell they named him A-corn,” clearly enunciating the corn. He was about 35 pounds when we rescued him. Since he was clearly abused or dumped or both, boyfriend always teases me about how Acorn used to have a “loving family.” Whenever I talk about how much I love the dog, he’ll say, “I bet he never did that with his loving family” or something about how much they miss him. I usually end up just rolling my eyes at him and then snapping, “He did not have a loving family! They didn’t take care of him and they don’t deserve him!” (It’s like my mom always said when my brother was picking on me, “The reaction is the reward.”) I remember when he was tiny and sweet, a timid puppy who needed love and encouragement. Now he’s all about chomping and fetching and wiggling. He still needs (and gets) a lot of love, but he’s so much more confident now. 20 hours of car ahead of him on his way to Colorado. One of my friends said last week that she truly believes that we gave Acorn (who also answers to Mr. Corn, General Cornwallis, and Hey!) the best home possible. She looked at him, lounging in the front lawn, not running away because he knows better, and told me that a lot of homes would have given him love but that we had given him the best. Since they’re not my words, I can totally use them to brag about how much he rocks. As I type this, he’s whining under my feet. Ha. It’s not all roses over here in puppy parenthood. When I got home from two fully exhausting days at adoption camp a couple of weekends ago, he had been alone all day and was needy and whining and miserable. So was I. It made me wonder how people do the whole parenting thing. Especially teachers. Whiny kids for eight hours, oh wait, you’re working a double, but with different whiny kids for the next eight hours! Woo! He’s a black lab something mix (collie? ), so his furry sweater is really long and when it’s 90 degrees out, it’s too hot to walk him. He doesn’t understand why we can’t go play all the time, because it’s hard to explain to a dog why I don’t want to end up on the 6:00 news for being the kind of dog parent who lets their dog boil. Communication problems. How he feels about camping. And miles and miles of sticks. I love him. I can’t explain how much I love him. It’s the same way I feel about Carlos, that whenever I look at them, my heart somehow manages to both squeeze and overflow with love at the same time. The sass is strong in this one. I love watching boyfriend with him, too. I know from the moment boyfriend carried him into the house in Mississippi that he was ours, but boyfriend wasn’t so sure. I’ll never forget it when, after we’d given the dog his first bath, boyfriend held the dog’s little head in his hands, wiggled the dog’s ears, and asked him if he wanted to be best friends. Even though there were moments when boyfriend wasn’t so sure we’d ended up with the best dog, a lot of love and some hard lessons (don’t eat sandwiches or bad things will happen, etc.) have made him into a pretty excellent companion. Watching boyfriend come home from work and play with the dog is my favorite thing. Watching the dog try to run after boyfriend when he leaves for work tugs at my heart. It’s all good. We got so lucky. I know he did, too, but really, it’s us who came out ahead here. We have a funny, floppy son who brings up so much joy and so many sticks. And tennis balls. And antlers. And rope toys. There’s something wrong with Acorn. We knew it the moment we met him. He’s all floppy black puppy, but he’s got sad brown eyes. He sat there on the floor of the house in Mississippi, shaking fearfully, timid but so sweet. We fed him, we bathed him, and he was ours. I knew it instantly. Boyfriend was hesitant, we wanted to make sure there wasn’t anything wrong with him before we took him in. And there wasn’t, mostly. But there’s something wrong with Acorn. It isn’t physical. Whatever happened to him in the four and a half months before he joined our family left deep scars. We knew it when we met him, that he’d been mistreated. It’s in the way he cowers from an outstretched hand, the way he’s terrified of doors and floors, the way he used to curl himself up into a ball around other dogs. He’s anxious. Boyfriend likes to joke that he takes after his mother (me) in that way. He’s been ours since we fed him. That first night, he lay by the foot of our bed, and he’s been with us every night since. He’s loyal – when I’m outside in the front yard, I don’t have to worry about leashing him since I know he won’t go far. When we’re hiking, boyfriend usually takes the lead, and when Acorn can’t see me anymore, he’ll double back until he sees that I’m behind them, and that I’m okay. Then he’ll run back up to boyfriend. He’s like any other puppy, eating us out of house and home, chewing on everything he can get his paws on. He’s stubborn – he won’t come in until he’s done playing, and yesterday, leaving the dog park, we had to put him back into the car because he didn’t want to leave. The car was where we first realized he had deeper fears. The first few days, he wouldn’t jump in or out of the car. When you’d try to take him out, he’d plant his feet as though you removing him was going to be the worst thing. Same for getting in. And doors. And places he’s never been before. And bridges. He’s hesitant, nervous, afraid. He won’t go in the side door of the house. One day, boyfriend had the back gate open and he got out. Boyfriend found him, a few minutes later, waiting patiently at the front door to be let in. I disagree. I mean, I don’t think Acorn’s ever going to the most aggressive, alpha male out there, but I do think that we can love a lot of the fear out of him. He used to freak out about the linoleum in our kitchen (I mean, who wouldn’t?). He’d scamper across it like it was burning lava. He wouldn’t eat if his bowl was on it, and if he did, he’d run back to the safety of the living room as soon as he could. But now, if I’m in the kitchen, he’ll sit patiently behind me or lay down on the floor in front of the refrigerator. He’s getting there. Instead of getting upset with him, I’ve been as patient as possible. At first, I set the bowl just inches onto the linoleum, where he could eat with all paws on the wood floor. And then, I inched it in, so that eventually, he was standing with all fours on the floor, happily chowing down. He used to be unable to go outside without one of us. Now, I let him out and let him play outside until he signals that he’s ready to come in. He knows we’re coming back for him, that being outside isn’t being abandoned. Sometimes, after I’ve had enough of outside play, he’ll refuse to come in, carrying his rope toy and looking longingly at me. I’ll leave him outside until he comes to stand by the door, his signal that he’s done. He knows I’ll be there to let him in. Right now, he’s curled on the couch next to me, asleep. Even his dreams are calmer now. He used to yelp and squirm when he slept, nervous little yips. Now, he sleeps more soundly. When he falls asleep, he’s out. He’ll try to fight sleep, his eyes getting lower and lower until finally, they close and he melts into his sleeping position. It’s so sweet. After big hikes, he’s usually asleep before we even leave the parking lot. He’s got the most adorable face. He’s already learned the word “walk” and when you say it, his ears perk up and he stares at you expectantly. He’s all giant paws and he’s still mastering walking gracefully. We’re working on reassuring him that he’s safe, that we love him, that when he does something wrong he’ll be punished, but it will be reasonable and consistent. We’re finding out how to adapt to his nervous habits, and how to change the ones that are changeable. We’re exposing him to other dogs, so he’ll have buddies to play with and learn from. We’re letting him be loved by everyone who wants to love him — strangers always comment on what a sweet, adorable dog he is. I can’t help but think about how whoever it was that hurt him and then left him. I can’t help but think about what a miserable person they must be. I can’t help but be sad for all of the animals that don’t have loving homes. But I look at my two furry sons, both rescued, and I can’t help but feel like the most blessed person on this planet. Carlos, my FIV+ Chicago street cat, missing a fang and half an ear, who was returned to the shelter by a family. Acorn, my anxious black lab puppy, abandoned in Mississippi. They are my favorites. Carlos is fierce and too aggressive for his own good, but he loves his wet food and to be pet right under his chin, and will hop up onto the bathtub ledge to say hi while you’re taking a bath. He loves to curl up in the crook of your elbow and fall asleep with you. Acorn is sweet and playful, full of energy, who shakes with excitement when you come through the door. He loves ice cream treats and his rope toys, tearing up anything with a squeaker as soon as he can. These guys are part of my family. These guys deserve all of the love. I sometimes wonder if it was just meant to be. He was such an unexpected blessing. It’s like my brother said, “He’s such a precious little pup.” And he is. He’s our precious little (50 pounds and counting) pup. And I wouldn’t have it any other way. The funny thing about relationships is that they’re never what you think they’re going to be. That’s a good thing. Relationships are a terrifying prospect. Relationships are, for me, a finely tuned machine, something that only works when so many tiny moving parts click into perfect place. Relationships are the result of effort, careful attention to detail, and compromise. The beginning stages of a relationship can resemble a series of interviews. You are on your best behavior. You are spontaneous, energetic, upbeat, interesting. You are a carefully packaged product, marketed just so. You find someone whose company you enjoy, and you begin a relationship. There are dates, milestones, so many adorable firsts. Eventually, after months of careful consideration for the other person, you get comfortable. I don’t really do comfortable. For me, being comfortable is a sign that something really bad is about to happen. Comfortable isn’t a state for the long haul; it’s a transient time from which you’ll someday cull happy memories. But comfortable is a very real state, and eventually, it must be acknowledged and accepted, because sometimes, comfortable is the very best state, with far more potential for permanence than other sorts of emotions. Letting someone see your weird is another part of this alignment of relationship longevity. You get past the initial interview process, the fun stuff, the activities, the really “deep” conversations about things, and you’re left with the day-to-day stuff. Day-to-day stuff is far deeper than any sort of philosophical debate. That’s where everything you think you know about your relationship changes. Somewhere in the comfort zone, when you’ve let down your guard, you stop and realize that you’re in it for real, that this is real. You’ve stopped analyzing every text message for clues about love or chances at a fifth date. You’ve stopped panicking over which outfit to wear out (because you don’t have to wear anything but pajamas to stay at home!). You’ve started somehow syncing up your lives, your routines, your meals. Eventually, it’s “we” and “us” and errands. (Those aren’t the worst things, after all, despite what we’ve heard. Errands are my favorite part of a relationship. If you can run errands with someone, you can be with someone. It’s that simple.) That mindset is a gradual progression, whereas the actions tend to move as swiftly as they please. (Or is it the other way around?) The feelings of “I love you” come long before they are spoken out loud, hesitantly, anxiously. The best relationship advice I ever got was from a friend of mine who’s been with his girlfriend for three or so years (which, to me, seems like for-ev-er). He said, “You have to wake up every single day and decide to love that person.” It’s an active, ongoing decision. I love that. An active decision to love someone is so much more than that fairy tale happiness we’ve heard so much about (but very rarely see). When I told boyfriend this yesterday, he scoffed and told me that he hardly wakes up every day and thinks to himself, “I guess I’ll love Katie today, but I’m only doing this for Acorn.” I laughed, then tried to explain to him that how I love him is constant, present always, just a soft hum of normalcy coupled with that deep-seated sense of need for proximity. “It’s just there,” I said. He knows what I meant. What it is that draws you to someone isn’t what makes you stay with them, but sometimes the pull is unavoidable and the attraction undeniable. That’s when you finally have to accept that there’s something more there, that the questions and the expectations of how you thought you’d fall in love must be thrown to the wind (a pinch of caution should go, too, even though that’s terrible advice). It’s a weird journey. Sometimes it happens overnight but sometimes it takes forever to fall into place. I don’t know where it comes from, but I have this internal fear about relationships ending. Maybe everyone does. Maybe that’s a universal fear. Maybe every relationship will end. Columnist Dan Savage once said something about how you date people, you break up with people, you repeat the cycle over and over, until finally, you start dating someone and you never break up. That’s slightly comforting. Over the past month or so, I’ve been evaluating my relationship, removing myself from the bubble of “us” for assessment (something I’ve also tried to quit doing so much). We’re seven months in (this time), and other than the occasional little bump, we’re doing quite well. When we started dating again this summer, I was determined not to engage in the panic that goes with new relationships (or the resumption of an existing relationship). But I did, a little. The over-analyzing, the careful consideration. But here we are, months later. I am comfortable now. It caught me off-guard. I didn’t really see it coming. I don’t know what I was imagining when I started, and perhaps not having any sort of idealistic outcome in mind is the best thing. It’s not all magical, twinkling lights and rose petals and candles, but it’s real. I like that. This is the real. I like it. I have loved him for a very long time. I realized it this spring. During our first fight, almost six months into dating, I spat out, “I almost told you I loved you last night.” I had been holding onto it for so long, I knew it was only a matter of time before it came rushing out. When he finally told me, he said, “I was waiting for the perfect time to tell you, but now I realize there was no more perfect time than when we were in the oak bottom with the leaves falling around us. I love you. I love you. I love you.” And I knew he meant it. Now, every time he tells me he loves me, I imagine the day we spent the morning on a hill in the forest in Mississippi, not hunting, but just watching the leaves fall down around us. It was magical. Life is that weird journey where you have to let go sometimes and hope for the best, or at the very least, a great adventure. Love is, for me, the very best adventure. I’m going to need more than one post to discuss the Thanksgiving trip to Mississippi, but I’m going to start with the most important part: the puppy. Boyfriend loves dogs and has been wanting one for a while. He wanted a chocolate lab. (So does my brother.) I always object. I have nothing against chocolate labs, but why have a chocolate one when you could have a black one? Or a yellow one? A couple of days later, we were prepping for a bonfire when a different man came by with the same puppy and said that he’d found him running along the road and wanted to know if we’d like to have him. (He must have had some sense that we were in the market for a puppy. I’ll just assume that he was pulled in by our radiating need for puppy love, like a magnet or a force field.) Boyfriend was the one who talked to him, and then he yelled my name as he carried an armful of black something into the house. I opened the door and there was the black something, tail wagging and sniffing around. My heart stopped for a second – a puppy! We leapt into action and lured him into the bathtub with a piece of deer steak and then boyfriend held him while I began the soaping process – yuck. So much dirt! Poor puppy just rested his head on the edge of the tub and gave us sad eyes while the water went from clear to muddy brown. Boyfriend joked that he was doing the “Carlos submission” because when the cat gets a shower he just sits there and waits it out with the most pathetic look possible. The puppy stayed the night in our room on a blanket folded by the side of the bed. He’s house-trained and very well-behaved, minus his chewing problem. He left the room in the middle of the night and returned with my hiking boot. When I took that away from him, he returned with a slipper, so boyfriend put all shoes outside the door and closed it. Throughout the next few days, he’d run into the grandparents room to steal slippers and bring them back to his place in our room to munch on them. After the first night, we knew we were going to keep him. We had some work to do with the land his grandpa owns for hunting, so we took the puppy with us. 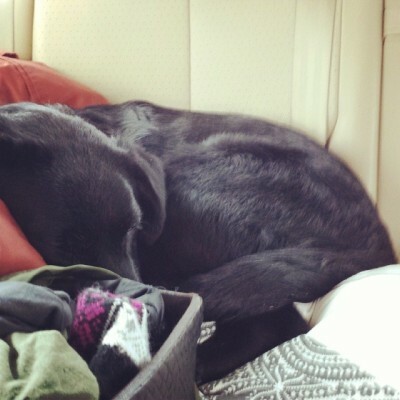 He followed us around constantly, running back and forth between us, sleeping on a pile of coats in the car when we were traveling. We bought him some puppy chow and a toy, plus a leash and collar so he’ll look like a proper dog with a family. The cat hates him, but is possibly realizing that since he’s not going to attack him, the puppy might be all right after all. Fingers crossed. We’ve been closing my bedroom door at night to separate them, but there haven’t been any daytime attacks yet, so I’m feeling optimistic. I don’t think Acorn’s ever seen a cat before, so that helps. I’m also absolutely exhausted from the drive back and am running on very little sleep – this puppy mothering business is rough. If it’s not chewing on shoes, it’s toilet paper, or mail, or clothes, or….. So now it’s off to work for me. I’ll post more Mississippi stories soon! My cousin was in town last week. He’s quite removed from all things pop culture, as he spends his time living a very simplified life. I find his perspective refreshing, and have so enjoyed being able to spend time with him not once but twice this summer. He was in the car with our grandmother and aunt during his brief visit, and they drove by a movie theater that simply showed “All is Lost” on its marquee. We laughed as he explained that he was quite concerned by this message, but I explained to him that “All is Lost” is the title of a film (which I know absolutely nothing about). Speaking of a simplified life (which I speak of as one who is impressed and motivated by the power to directly impact your own experiences with the choices you make), I’ve been spending a lot of time simplifying lately. It began out of necessity, but somewhere in the frantic rush to cut back on everything (I only somewhat joking refer to it as “austerity measures”), I found myself realizing how blessed I really am and how much there is to simply enjoy. In the darkest hours, I was solely focused on survival. As I grew tired and frustrated, impatient and anxious, I began to assess the positives, to focus on reinforcing the things that make me happy. Creating happiness and finding the good in the worst of it all is the hardest part, but I firmly believe that it is the most worthwhile endeavor in which I have engaged in quite some time. Sowing the seeds of positivity has led to a bountiful return for me in both my experiences and in my own emotions. It began when I sat down with now-boyfriend earlier this summer and he told me over dinner that he hadn’t done anything he didn’t want to in months. My cousin’s perspective is quite similar. He travels freely, lives simply, does exactly what he wants, and in turn, has a refreshingly grounded air of contentment about him. I was so caught up in the struggle to move forward without direction that I neglected myself, first and foremost, but also my own drive. This year may not have been my favorite year, but it’s been rewarding in so many different ways. Right now, I’m sitting on my front porch, feet perched on the railing, absorbing the radiant Colorado November sunshine. A steaming mug of tea sits next to me and a very jealous cat sits just on the other side of the front door. This is bliss. I am looking at the most positive job week I’ve had in a long time. 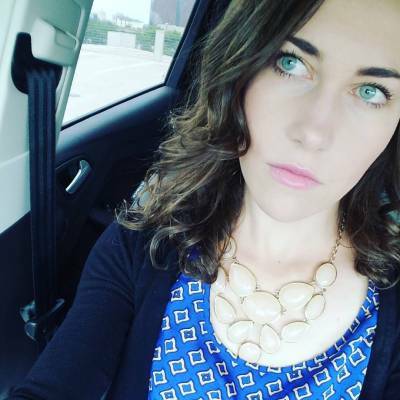 I had my first actual interview last week, rocked it, and was offered the job. I will be turning it down. I am also poised on the brink of creating a position with a company I’ve been a part of for the better part of a decade, and am thrilled by the level of respect and honesty I’ve been offered. “What’s your ideal job?” my boss asked. “Let’s work on creating something that will work for the both of us.” Marketing, administrative work to include payroll, and assistant managing all wrapped up in one package? Perfect. I am so pleased. I did this. I offered the boss my services, explaining that I’d love to help with the office and the marketing, then handed him my resume to remind him that I’m far more than the sixteen-year old he hired all those years ago. He responded with the offer and we’re all set to sit down and hash out the details. And even more! I’m meeting with a recruiter for coffee on Friday. Where that will go, I’m not sure, but I’m thrilled by the prospect of reigniting my drive towards a greater future for myself. But it’s not just on the job front. I’m finding myself able to appreciate the positives and the beauty all around me. My strange love of “the hot dog man” and his dog is my favorite example of good in the world. He comes in to work most days and teases me. He’s still upset that I won’t give him my grandmother’s phone number, and we’ve discussed why women are the root of all evil. (According to him, the ship that ran aground off the coast of Italy was most likely due to a woman. “You know why I was the captain of two destroyers?” he asked me. “I didn’t get distracted by women.”) Sometimes, he tries to give me money and tells me not to spend it on men. He asked me if I was going to join the Navy when I turn seventeen. I laughed and told him that I’m far older than seventeen and that my boyfriend joined the Marines when he was seventeen. “Is he still in?” he asked. I told him that no, he isn’t. “Well, when you get sick of him, just send him back!” he said. The hot dog man got a hundred-dollar bill from a random stranger the other day. She had just sold her house and somehow had a bunch of money from the closing, so she handed him the 100 and told him that her kids were grown and that she didn’t need it, and that she wanted to spread some good into the world. We told him that we’re going to start calling him “The Hundred Dollar Man” and he said his typical farewell of “whatever” and gave us a wave before finding his walker (with the dog tied to it) outside and heading off towards home. He probably has no idea how much I enjoy seeing him. Yesterday, when he was in the store, he was talking to a mother and her young daughter. He doesn’t see well (blind as a bat might be a more accurate description), and at one point, he was gesticulating with his hand out and the little girl reached up and high-fived him. He smiled and asked her if she was going to hold his hand. It was such a sweet moment. He’s the best. I don’t mean to ramble, but he’s one of those examples of the best parts of the world. They’re the most unexpected. They take you by surprise and uplift you in the strangest ways. I’m going to make the most of this beautiful life, even though it’s not at all how I expected it would be. I think sometimes it’s the weird randomness of the universe that’s the most beautiful part of it all. This year will be the first year in a long time I’m not in Denver for Thanksgiving. (Not counting 2010, when Mike and I were in Africa.) Thanksgiving is one of my favorite holidays. It’s not as stressful as other holidays; there aren’t any gifts; it’s more about food than it is anything else. Since I’m not one who eagerly anticipates the shopping season, I have nothing to do that day and the next except lounge around and eat leftovers. This year is a big year. I’m going to Mississippi with boyfriend. I’m going to meet part of his family and go hunting. Oh god. Me hunting deer? I’m most excited about a road trip. I drive. He sleeps. Clears the mind. I think I’m most nervous about deer hunting. What if I’m bored? Sitting still isn’t my strong suit. Sitting still and being quiet definitely aren’t things at which I excel. What if I actually kill one? Not likely. I told him I’d most likely either cry or be super into it. I met his grandfather last week. We went to a hockey game and then had dinner the next night. I’m a huge fan – I love families and his grandpa had some great stories. I’m less nervous about the family liking me now that I’ve met him. Still, I’ve never been to the South. I’ve already made the silent promise to myself not to say anything until after we’ve left. I want to take it all in and experience as much as possible. It’s going to be a very new adventure, but it’s also going to be a very necessary week off of work for me, which I’m looking very forward to. In other news: I’m now the assistant manager at my store (officially, since I’ve been the assistant manager in all but name for quite some time now). I’ll be assisting with the revamping of the store as well as the training of the three new kids we hired. But more exciting than that is the prospect of some marketing and office work. The owner and I have yet to sit down and actually hash out all of the specific duties, but I’m thrilled about the opportunity to do more of what the marketing and administrative stuff while still being able to keep up my cake decorating and customer service. Things are looking up, which is good. Finally a nice break for me and the chance for more positive opportunities and career growth, which are things that I’m looking forward to taking advantage of. It’s been rainy and cold all week here in Denver, which is a relief – it feels like we’ve had nothing but heat for months. This weather means sweaters. And black tights. And sweatpants. I love sweatpants. I own more pairs of mens pajama pants than I care to admit, because they’re always so cozy and comfortable. The other night, I was cold and at the boy’s house. I asked him if I could borrow his pair of fuzzy sweatpants. He looked at me incredulously. “Fuzzy sweatpants, Katie?” I knew he knew exactly which pair I was talking about. “Men don’t own fuzzy sweatpants. They’re flannel.” (I think he said flannel, anything but fuzzy sweatpants.) Five minutes later, I was happily inside a pair of borrowed fuzzy sweatpants. As much as I dislike cold, the snuggling-centered parts of my brain love winter because it’s an excuse to pile on blankets and make nests of soft things. I’m thrilled that it’s that time of year again.